Shaving, we hate doing it, but it feels amazing after. The worst part, however, is realizing how much we spend on new razors and refills. I used to buy generic brand 3 blade razors because I like saving money, but it it wasn’t cutting it for me. Literally, it didn’t feel like a close enough shave, so I started to get the Schick Quatro with refillable razors. It got so expensive! We’ve been stuck buying these products because we have no choice, razors are a necessity. For women, there are tons of fruit scented, magical moisture strip options in our aisle that sometimes we stand there not even sure what we need, or what’s worth the price. So I started looking for different options. 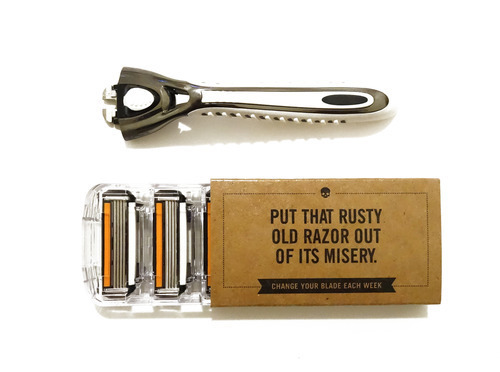 I heard about Dollar Shave Club, a box membership type site that ships you blade refills every month for a set price. They have three different tiers, 2 blade, 4 blade, and 5 blade. You can look at the differences here. But wait this site is marketed towards men, right? 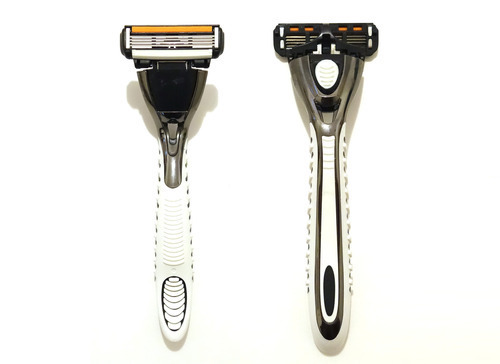 Are men’s and women’s razors really any different? It’s worth a try, if the price is amazing, right? I decided to purchase the “4x” razor, 4 stainless steel blades. This came to a grand total of only $6 a month (shipping included). Not bad. Here’s the package I received in the mail about a week later after I ordered. Your first package will come with one heavy duty handle (it felt pretty hefty in my tiny hands haha), 4 cartridges, a sample of shave butter, and a copy of their monthly publication. All this for $6 is a steal! Now for the test! After I lathered my usual shaving cream, I made a single stroke up my leg, and it was effortless. The sharp, high quality blade allows for a clean cut, which is the top reason why it felt like the smoothest shave ever. Let’s do the math, again. Also you can opt in to receive refills every other month. DSC recommends to replace your blade every week, but i haven’t in three weeks and it feels new still. For us girls, our hair isn’t as coarse as men’s beards and mustaches, so that’s why they go through them faster. So to save some money change your shipment to only 6 times a year instead of 12, and boom your costs have been cut in half. $36 for a whole years supply of razors sounds like an amazing deal! 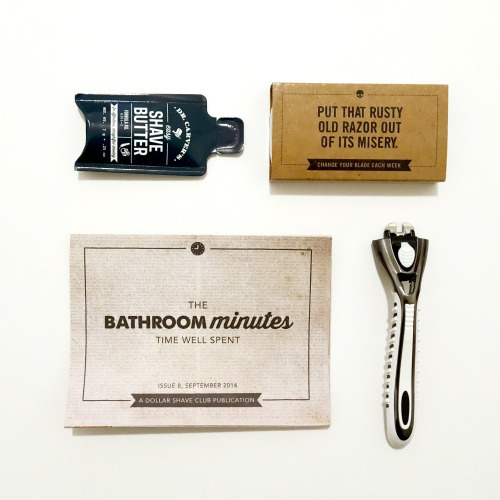 Overall, I’m very happy I decided to join Dollar Shave Club. 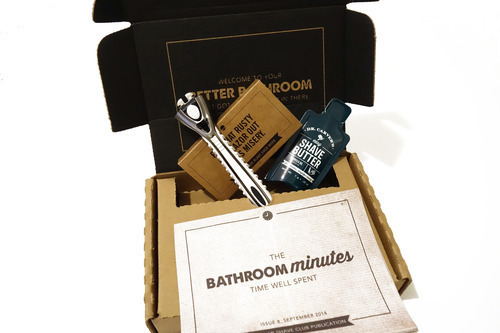 No more wasting money on overpriced refills, no more driving to the store when you need an emergency shave, no more getting mad because you forgot to get refills on your shopping trip. DSC makes it an easy process, one less thing to worry about. I highly recommend their 4x razor for women, even if it looks like it’s for men. Pink handles and fruity flavors don’t really make a difference, let’s be real. 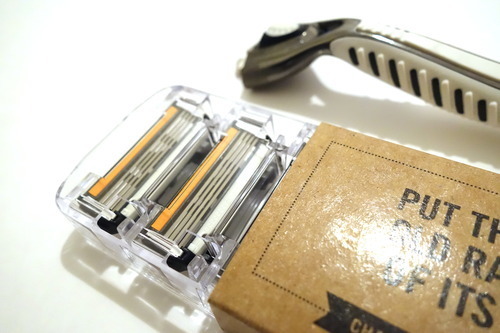 Need some blades, go get some at Dollar Shave Club now!